The U.S. Geological Survey has a long history of responding to and documenting the impacts of storms along the Nation’s coasts and incorporating these data into storm impact and coastal change vulnerability assessments. These studies, however, have traditionally focused on sandy shorelines and sandy barrier-island systems, without consideration of impacts to coastal wetlands. 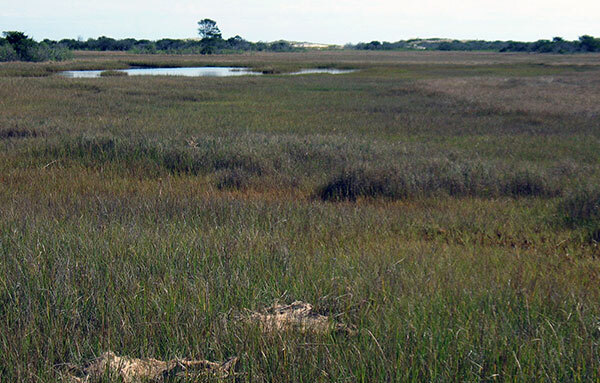 The goal of the Barrier Island and Estuarine Wetland Physical Change Assessment project is to integrate a wetland-change assessment with existing coastal-change assessments for the adjacent sandy dunes and beaches, initially focusing on Assateague Island along the Maryland and Virginia coastline. Assateague Island was impacted by waves and storm surge associated with the passage of Hurricane Sandy in October 2012, including erosion and overwash along the ocean-facing sandy shoreline as well as erosion and overwash deposition in the back-barrier and estuarine bay environments. This report serves as an archive of data that were derived from Landsat 5 and Landsat 8 imagery from 1984 to 2014, including wetland and terrestrial habitat extents; open-ocean, back-barrier, and estuarine mainland shoreline positions; and sand-line positions along the estuarine mainland and barrier shorelines from Assateague Island, Maryland to Metompkin Island, Virginia. The geographic information system data files with accompanying formal Federal Geographic Data Committee metadata can be downloaded from the Data Downloads page. This study was funded under the Disaster Relief Appropriations Act of 2013, using the U.S. Department of the Interior Hurricane Sandy supplemental funding. Jolene Gittens (U.S. Geological Survey) assisted with the report layout and Web design. The authors thank Karen Morgan, Arnell Forde (U.S. Geological Survey), and Ginger Range (Cherokee Nation Technology Solutions) for conducting scientific, editorial, and metadata reviews that improved the content and presentation of the report. Although these data have been processed successfully on a computer system at the U.S. Geological Survey (USGS), no warranty expressed or implied is made regarding the display or utility of the data on any other system or for general or scientific purposes, nor shall the act of distribution constitute any such warranty. The USGS or the U.S. Government shall not be held liable for improper or incorrect use of the data described and (or) contained herein. Any use of trade, firm, or product names is for descriptive purposes only and does not imply endorsement by the U.S. Government. Bernier, J.C., Douglas, S.H., Terrano, J.F., Barras, J.A., Plant, N.G., and Smith, C.G., 2015, Land-cover types, shoreline positions, and sand extents derived from Landsat satellite imagery, Assateague Island to Metompkin Island, Maryland and Virginia, 1984 to 2014: U.S. Geological Survey Data Series 968, https://dx.doi.org/10.3133/ds968.